PRESENTED BY STRUT AND AUSDANCE WA, THIS NOT SO MODEST DANCE FESTIVAL INCLUDED IMPORTANT ARTISTS FROM THE INTERNATIONAL SCENE SUCH AS JONATHAN BURROWS (UK), DIDIER THERON (FRANCE) AND SIDI LARBI CHERKAOUI (BELGIUM) ALONGSIDE THE LOCAL, WITH PERTH-BASED ALICE LEE HOLLAND’S TINY LITTLE TRAGEDIES AND RECENT WESTERN AUSTRALIAN ACADEMY OF PERFORMING ARTS (WAAPA) GRADUATES INCLUDED IN A MIXED BILL, MOVEMEMIX. Alongside the performance program were workshop opportunities for Perth and Sydney artists with Burrows and his creative colleague, composer Matteo Fargion, and I saw Theron conduct a masterclass with third year students at WAAPA. This represents what STRUT has been doing so well for so long—supporting local artist development in an international context with links to interstate artists. STRUT Director Agnes Michelet is a powerhouse supported by a proactive WA Ausdance branch. Burrows and Fargion’s double-bill, Cheap Lecture and The Cow Piece, seemed a perfect expression of something that hovers between “marching and flight,” a phrase from the spoken score of Cheap Lecture. 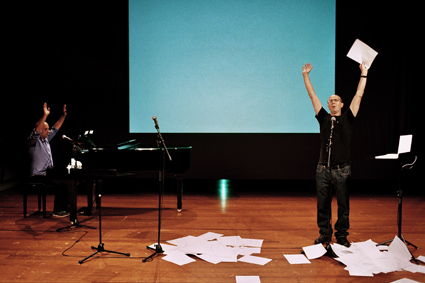 The ‘lecture’ is a self-reflexive piece on the process of making work, consisting of spoken text, some movement directions and musical interludes. The Cow Piece is, effectively, a demonstration of the compositional principles laid out in the first work, using a table full of small plastic cows to beat out rhythms, perform simple dances and act out brief dramatic scenarios. The score for Cheap Lecture is a homage to John Cage’s Lecture on Nothing (1959) which is mentioned in the piece, taking not only its formal structure but a mid-century, Beat-poetesque, New York pace (as suggested by Theron) and a neo-Surrealist bent à la Cage associate Robert Rauschenberg. While the driving spoken word, consisting mostly of pithy statements, floods over us a few quotes are suspended in the air; “composition is about making a choice including the choice to make no choice,” “we don’t know what we’re doing and we’re doing it” (after Cage’s “I have nothing to say and I’m saying it”). What does become clear is that the first half addresses the making of work and the second its reception: “the return of a theme alters everything,” “repetition can pass through boredom into a state of grace.” Surreal actions come in the form of Burrows’ extreme Cossack-dancer energy and Fargion slowly looping a noose around a small plastic cow’s neck. The two giggle sometimes. The turn to dance history for inspiration in Burrows and Fargion’s work (as they state, “everything is stolen”) is also apparent in Cherkaoui’s Faun, commissioned by Sadlers Wells for their In the Spirit of Diaghilev program in 2009. Faun featured WAAPA graduate James O’Hara in a romantic duet with Daisy Phillips to the original score by Debussy (for the original choreography by Vaslav Nijinsky in 1912) with additional music by UK composer-superstar Nitin Sawhney. The mood is mythical and the movement virtuosic within a simple scene suggestive of a forest. O’Hara’s faun, established in an opening solo, is fiercely three-dimensional, opposing the two-dimensional mode of Nijinsky’s iconic work, creating circular patterns of fluid, floor-based, acrobatic movement. Sawhney’s score accompanies Phillips whose almost contortionist postures and movements seek to seduce through display. The duet section features more extreme poses as the two young bodies intertwine and the overall effect is mesmerising. The entire work is currently viewable on You Tube. In contrast, Didier Theron’s Harakiri is a formalist piece to a discordant, driven and escalating score. Having encountered his Shanghai Bolero last year (RT105) I was prepared for the limited movement palette which consists of a lunging walk and variations in arm positions, with break-out solos puncturing the repetitions. Performed by five mature Australian artists (Matthew Morris, Sue Peacock, Aimee Smith, Isabella Stone, Sete Tele and Michael Whaites), the theme of human sacrifice emerges in the violent quality of the solos and the stoic inevitability of the patterned composition once it is set in motion. Theron’s characteristically charged actions draw expression from geometry, one of his stated aims. Holland’s Tiny Little Tragedies could have been, quite simply, an exploration of the Jung quotation in her program: “I’d rather be whole, than good.” The contrasting dark and light in the piece that works through heavy, sculptural group work and airborne, dramatic solos suggests inner struggles and tensions between individual responsibilities and ‘the community.’ But some voice-over narratives about loss and regret seem to say either too much or too little, and while the intensely virtuosic choreography shows off the excellent dancers in the group, I couldn’t help feeling that there were just too many steps. The short works in MoveMeMix were really sketches and excerpts, with Brooke Leeder’s Not Even New York perfectly pitched as a single movement idea inspired by international travel. A duet sequence consists entirely of hip displacements that instigate falls off-balance and movements of hesitancy. A final ‘mime’ sequence recalling two people forced into close proximity in the Metro or Tube takes this to a literal conclusion. Fleck&Flecker by Cass Mortimer-Eipper and Emma Sandall was an excerpt from a recent season in Perth and featured assured duet work and some intriguing movement from Mortimer-Eipper as one half of a conversation. Pieces by Emma Fishwick and Bianca Martin were not quite suited for such a formal performance season, seeming more like works-in-progress. Crash Course, the work-in-progress by James Berlyn, who has been collaborating with Sydney-based Nikki Heywood, was also presented during the festival. An immersion in the world of the migrant or physical therapy patient, the piece featured an entire fictional language created by Berlyn into which we are inducted. Themes of power and exclusion lie beneath this promising germ of an idea. Here’s hoping STRUT and Ausdance WA can build and maintain this West-Coast answer to Melbourne’s Dance Massive, an event shaped so beautifully around STRUT’s commitment to local artist development in an international context.